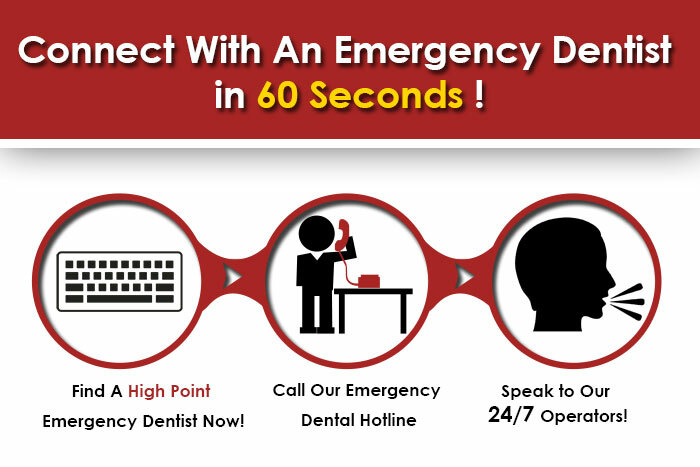 24 hour emergency dentists are highly required by people of all cities and countries, usually because of reasons such as toothaches, tooth infections, trauma to the jaw, and much more. If they happen to be around, you could easily call them up for whatever dental problem you have after office hours. Like most other regions, High Point has its emergency dentists who make use of great practice and top-notch equipment to help their patients. High Point is well-known for its expertise of furniture pieces, a source of attraction for people all over this city and regions nearby. Over 107,000 people reside in High Point, out of which at least 55% are young adults and adults, all between 18 and 65 years of age. All those residents who get mugged or into a bad fight, knocking out a tooth or two, or misplacing their jaw could visit the nearest emergency dentist. Along with setting things right, these experts will make sure that the pain is also in control. Call at 336 883 1371 to get in touch with this team of dental experts. Cleanings, dentures, free oral cancer screenings, invisalign braces, root canals, veneers and much more. They are open on Tuesdays, Wednesdays, Thursdays and Fridays, from 8.00 a.m. to 1.00 p.m., and again from 2.00 p.m. to 5.00 p.m. Deep River Dentistry is appreciated and renowned because it makes patients feel confident and safe under their watch. Additionally, they scrutinize the dental problems of patients of all age ranges, be it a little child or a full-grown man. A dentist who was brought up in High Point itself, Jon B. Byrd is focused on causing happiness among his patients. He believes that patients should be dealt with care and love, constantly informed of their overall dental health and the options they have, in terms of dental check-ups and treatments. Dr. Byrd excels at family dentistry, which is why you could bring your baby in for a dental check-up when they grow their first tooth. His website contains an online form for you and other potential patients who have queries or who wish to place an appointment with Dr. Byrd. Otherwise, you could call up at 336 882 4412 to book a meeting with him and his team of professionals. Available on Mondays, Tuesdays, Wednesdays, Thursdays and Fridays, this dental care unit also welcomes all patients who require emergency dental care. All you need to do is fill up their online form or get in touch with them at the number 336 889 2434. Their services encompass a myriad of procedures out of which one-day crowns happen to be quite famous. For whatever queries, please feel free to call them up or email them.